After locking in some gains yesterday, crude prices remain higher this morning. Prices gained 44 cents yesterday, closing at $51.87, the highest close since Sept 27 and continuing a three-day streak of gains. Whether today will continue that streak is yet to be seen; prices are stagnating with modest gains, awaiting the API’s inventory report this afternoon. The API was 180 degrees opposite of the EIA data, so markets may take this week’s report with a grain of salt, but they’re still certainly waiting to see what the data says. Crude markets are $51.94 today, up a mere 7 cents. Refined markets have been mixed. Gasoline prices ended the day lower yesterday, shedding half a cent to end the day at $1.6169. 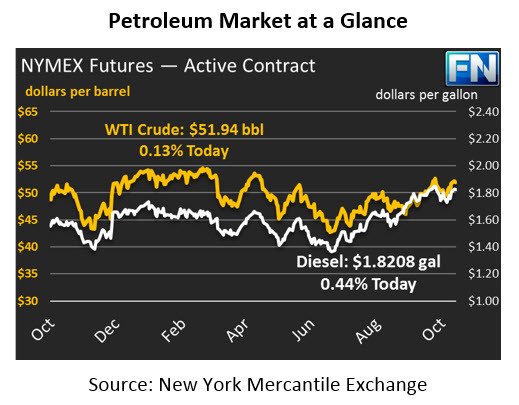 Markets expect gasoline stocks to remain high during the winter, putting downward pressure on prices. This morning, on the other hand, gasoline prices are outperforming crude and diesel prices, with gains of .92 cents (.6%). Prices are $1.6261 currently. Diesel gained roughly 1.5 cents yesterday, a modest gain of .9%, and today has continued those gains by adding .79 cents (.4%) to reach $1.8208. Delayed by Hurricane Nate, several cargo ships filled with diesel fuels have reportedly left the U.S. for Central and South America, helping to keep prices elevated. Markets are beginning to wonder how much farther the diesel run can go. 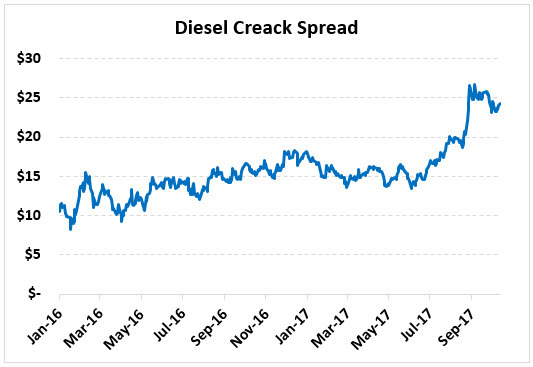 Diesel prices have gone up significantly relative to crude prices in the past two months, and markets are wondering when the correction will come. Markets are still being driven by tensions in the Middle East. Goldman Sachs estimates that if Iraq’s production is taken offline, Brent crude prices could rise by $2.50 (the effect on U.S. WTI prices would likely be comparable). However, both the Iraqis and the Kurds rely on oil revenues, giving them a strong incentive to keep production flowing. Yesterday, 2 million barrels of oil were shipped on cargo ships out of the area, and another 1 million barrels are expected to flow today. There’s been mixed news on whether production has been shut down or not, with some news sources saying 350 kbpd have gone offline, while Iraqi and Kurdish forces deny the allegations. Whether production goes offline or not, the uncertainty stemming from conflicting stories and a murky situation will certainly impact market volatility.